Arbel mountain has many turtle doves and the valley between hills is turtle valley. The village Magdala is near. There was Migdal Oor: one point of the signaling light ( sent from The Temple Mount as a light chain during the time ot he Second Temple . Jesus Sen the Keren Oor before His appearing to Apostles, when He sent Maria from Magdala to give a message after His resurrection, His Turtle of Ark and His olive tree message from the New time of Mercy of God). Capernaum is about 200 m under the sealevel. Bethsaida, the village of Simon Peter and his brother Andrew even on still lower level than Capernaum, just únder water nowadays) . When john ( the Baptist ) was arrested , Jesus withdraw into Galilee, and leaving Nazareth ( on the mauntain) and dwelt in capernaum by the Cennesareth sea ) in the territory of Zebulon and Naphthali. (St. Matthew, the Levite wrote : Mt. 4: 13). He came down fromt the Issachar territory from the boundaries of Zebulkun and Assher. 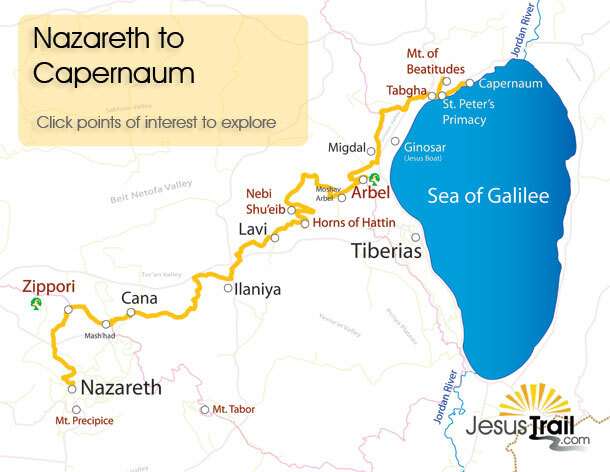 That means a trip of 65 km walking paths through Cana and hill up hill down from the 500 m high mountainous Nazareth to the low sea side path , more than -200 under the sea level. When He passed Cana, He already saw Nathanael sitting under the Fig tree. but He was hurring down , down, to the fishermen villages first to call to His apostles fishermen from the most low place of this world. and over every vreeping thing that creeps upon the earth. Simon, the Fisherman from Beth-Zaida – later Apostle St. Peter . What he writes? Why Jesus the Son of God did choose Fishermen to become the First Apostles? There were still on Earth people who – according the purpose of the Creation of mankind (Genesis 1:26) had gone down to the coasts of the sea to have dominion over the fishes of the sea, They were Fishermen. לב וַיִּכְתָּב-שָׁם, עַל-הָאֲבָנִים–אֵת, מִשְׁנֵה תּוֹרַת מֹשֶׁה, אֲשֶׁר כָּתַב, לִפְנֵי בְּנֵי יִשְׂרָאֵל. 32 And he wrote there upon the stones a copy of the law of Moses, which he wrote before the children of Israel. לג וְכָל-יִשְׂרָאֵל וּזְקֵנָיו וְשֹׁטְרִים וְשֹׁפְטָיו עֹמְדִים מִזֶּה וּמִזֶּה לָאָרוֹן נֶגֶד הַכֹּהֲנִים הַלְוִיִּם נֹשְׂאֵי אֲרוֹן בְּרִית-יְהוָה, כַּגֵּר כָּאֶזְרָח–חֶצְיוֹ אֶל-מוּל הַר-גְּרִזִים, וְהַחֶצְיוֹ אֶל-מוּל הַר-עֵיבָל: כַּאֲשֶׁר צִוָּה מֹשֶׁה עֶבֶד-יְהוָה, לְבָרֵךְ אֶת-הָעָם יִשְׂרָאֵל–בָּרִאשֹׁנָה. 33 And all Israel, and their elders and officers, and their judges, stood on this side the ark and on that side before the priests the Levites, that bore the ark of the covenant of the LORD, as well the stranger as the home-born; half of them in front of mount Gerizim and half of them in front of mount Ebal; as Moses the servant of the LORD had commanded at the first, that they should bless the people of Israel. לד וְאַחֲרֵי-כֵן, קָרָא אֶת-כָּל-דִּבְרֵי הַתּוֹרָה, הַבְּרָכָה, וְהַקְּלָלָה–כְּכָל-הַכָּתוּב, בְּסֵפֶר הַתּוֹרָה. 34 And afterward he read all the words of the law, the blessing and the curse, according to all that is written in the book of the law. לה לֹא-הָיָה דָבָר, מִכֹּל אֲשֶׁר-צִוָּה מֹשֶׁה–אֲשֶׁר לֹא-קָרָא יְהוֹשֻׁעַ, נֶגֶד כָּל-קְהַל יִשְׂרָאֵל וְהַנָּשִׁים וְהַטַּף, וְהַגֵּר, הַהֹלֵךְ בְּקִרְבָּם. 35 There was not a word of all that Moses commanded, which Joshua read not before all the assembly of Israel, and the women, and the little ones, and the strangers that walked among them. Days of earthquakes and desolations..
Jesus left the Temple and was going away, when His disciples came to point out to Him the buildings of the Temple. But He answered them: You see all these, do you not? Truly, I say to you, there will not be left here one stone upon another, that will not be thrown down. As He sat on the Mount of olives, the disciples came to Him privately, saying: Tell us, when will this be, and what will be the sign of Your coming and of the close of the age? And Jesus answered them: Take heed that no one leads you astray. For many will come in My name, saying: I am the Messias, and they will lead many astray. And you will hear of wars and rumours of wars; see, that that you are not horrified; for this must take place, but the end is not yet. For nation will rise against nation, and kingdom against kingdom, and there will be famines and earthquakes in various places; all this is but the beginning of the birth-pangs. Then they will deliver you up to tribulation, and put you to death; and you will be hated by all nations for My name´s sake. And then many will fall away and betray one another, and hate one another. An many false prophets will arise and lead many astray. And because wickedness is multiplied, most men´s love will grow cold. But he who endures to the end will be saved. And this gospel of the kingdom will be preached ( to plow new fields and sow the Word of God) throughout the whole world, as a testimony to all nations; and then the end (The time of the God´s Harvest) will come. The people who know their God, shall stand firm and take action. The elected love God over anything in the world. V. M. 6: 5.
and their neighbours as themselves. III. M. 19: 18.